Congratulations! 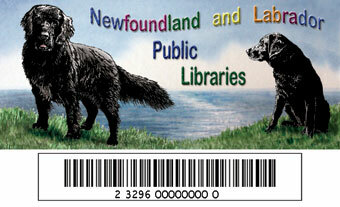 You are about to take the first step in registering for your FREE Newfoundland & Labrador Public Libraries library card. Your new library card will give you free access to a variety of public library programs and services. Borrow books, magazines, newspapers, CDs and DVDs. See what items you have checked out. See what items you have on hold. Renew, place holds for items online. Access to our public computers and internet. Attend our library events and training sessions. If you already have a library card that says "Newfoundland and Labrador Public Libraries" and has a barcode that starts with the numbers 23296, you do not need to complete this application. Please verify that the correct Birth Date has been selected. If Birth Date needs to be updated, please re-select the correct day, month and year from the drop-downs. For patrons age 12 and under, please enter a Parent or Guardian Name. For patrons age 13 and older, a Parent or Guardian Name is not required. By completing and submitting this online registration, you are confirming that you are a resident of the province of Newfoundland and Labrador and agree to all of the terms and conditions relating to the issuance and use of a Newfoundland and Labrador Public Library Card. Patrons under the age of 13 require a parent or guardian consent to obtain a library card. After our processing department has confirmed your identity, you will be issued your new card. When the card is issued, you will receive your library card number and PIN through email and you will be able to start using library services immediately upon receipt. Your physical card will be mailed to your confirmed Newfoundland & Labrador mailing address within a few days. If you do not agree with the above, or are not a full time resident of the province of Newfoundland & Labrador, please do not submit this form. Please verify that the information you have provided above is correct before clicking "Submit Library Card Application".